It’s a non-wool based creation! 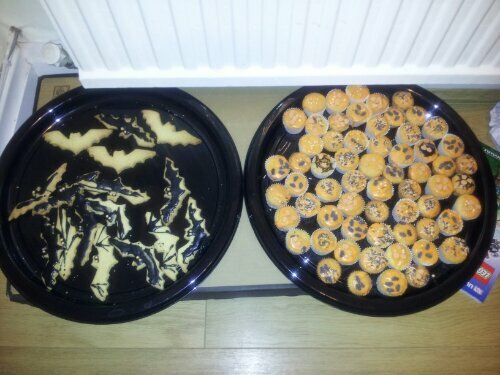 My children went trick or treating (just to the 3 neighboring streets and only to the houses displaying pumpkins) and I decided for our offerings, there would not be any sweets, mainly because I didn’t want half a tub still in the house for the next 2 weeks, so we made bat biscuits and Halloween cupcakes, which were very much appreciated by the children who came by, mainly from one of 3 local schools and it’s funny how many mum’s I knew 🙂 ! I had the children making shortbread biscuits yesterday and today I made 96 cupcakes and the children set up a production line the kitchen to decorate. I don’t know what to think of the frequent calls to Dad for quality control checks…. One of the boys (about 10 years old) loudly said to his friends that they were yummy as they walked away, he can come back next year!